In a just-released book, Work and the Welfare State, SSA Associate Professor Evelyn Z. Brodkin presents a critical examination of efforts to change the welfare state to a workfare state. Workfare-style policies, known as "labor market activation" in Europe, are now common around the world. Yet, exactly what they do and how they work remain matters of controversy. Some analysts focus on what these policies do to promote work among the unemployed and disadvantaged by providing services such as education and training. Others criticize policies for withdrawing social support from those unable to make ends meet through employment, for example, placing time limits on cash assistance or demanding unpaid work from those needing aid. In order to shed new light on old debates about policies of workfare and activation, Brodkin brings together an international group of scholars, who take analysis from policy-on-the-page to policy-in-practice. This book is the first to bring a street-level approach to international research on welfare state policy, politics, and management, offering a clear and coherent interpretation of how workfare-style policies are taking shape on the ground. Chapters in this volume, co-edited by Brodkin and Marston, look at on-the-ground issues in six countries: the US, UK, Australia, Denmark, Germany, and the Netherlands. Peeling back the political rhetoric and technical policy jargon, these studies investigate what really goes on in the name of workfare and activation policies and what that means for the poor, unemployed, and marginalized populations subject to these policies. As Evelyn Brodkin explains, "Workfare is a global project with direct significance for the poor, marginalized, and unemployed. Beyond its impact on individuals, this project has broad political significance because it is redrawing the boundaries between work and the welfare state, changing the state's role in buffering the consequences of market-derived inequalities and economic vulnerabilities." Work and the Welfare State reveals the critical, yet largely hidden, role of recent governance and management reforms in shaping the workfare project around the world. It shows how these reforms have altered organizational arrangements and practices to emphasize workfare's harsher regulatory features and undermine its potentially enabling ones. The book is groundbreaking in providing a multi-dimensional view of street-level organizations "at the intersection of the state, its policies, and individuals." As Brodkin explains, street-level organizations include "the many varieties of public, private, and hybrid agencies now engaged in policy delivery and increasingly operating under the influence of new governance and managerial regimes." These organizations play a "complex and multi-dimensional role ... in the policy process, one in which they not only implement policy, but also transform it. These processes of transformation – and their consequences – lack visibility, making them difficult to assess and, consequently, to contest.... This has critical implications, not only for policy, but also for welfare state politics, in which visibility and the potential for political feedback are closely linked." Studies in this book take up broad questions of workfare policy and the politics of welfare state transformation; critically assess governance and management reform as a "second track" for policy change; and examine how street-level practices mediate racial, ethnic, and national status. Among the contributors are SSA Associate Professors Julia Henly and Susan Lambert, who bring an organizational perspective to examining the on-the-ground realities of lower-wage jobs. Along with many of the book's other contributors, they participated in a international symposium, "Welfare States in Transition," organized by Brodkin as part of SSA's 2009 Centennial celebration and co-sponsored by the RESQ international research network with support from the Danish Social Science Research Council. Discussions at this symposium laid the groundwork for the project that resulted in this book. As a major contribution to social policy research, this book will be of special interest to civic leaders and public managers, leaders of social service agencies, and students of public management, social policy, and welfare state politics. Evelyn Z. Brodkin is Associate Professor at the School of Social Service Administration and holds a Ph.D. in Political Science from the Massachusetts Institute of Technology. She is recipient of American Political Science Association's Herbert Kaufman Award, the American Society for Public Administration's Burchfield Award, and was named a Fellow of the Open Society Institute. Brodkin has held visiting professorships in Australia, Denmark, France, and Mexico. Gregory Marston is a professor of social policy at the School of Public Health and Social Work, Queensland University of Technology in Australia. 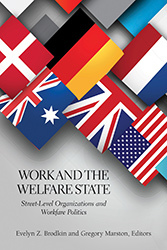 Work and the Welfare State: Street-Level Organizations and Workfare Politics is now available in the US from Georgetown University Press and is co-published in Europe by DJØF Publishing. To purchase a copy at a special discount, enter TX28 at checkout. Brodkin will discuss the book at the Seminary Co-op Bookstore on October, 24, 2013 at 6:00 pm. The public is invited. The Seminary Co-op is located at 5751 S Woodlawn Ave., Chicago, IL 60637.